Stare Miasto – the Old City – despite its name, is not the oldest part of the city. This is the part of Poznań that had first received city privileges, and the part which has been developed over time since the mid XIII century, retaining the original medieval urban layout. The medieval buildings were later rebuilt, mainly in the renaissance and baroque styles. Undoubtedly the jewel of the Stary Miasto is the Ratusz – City Hall in its XVI century style, with the famous eastern loggia and exquisite Renaissance Chamber. However, most visitors are attracted to the facade of the Ratusz (City Hall), by the goats – koziołki, butting each other on the tower, daily at noon, to the notes of the city trumpet call – the hejnał. Now the Ratusz no longer serves the city council, its chambers now accommodate the City of Poznań History Museum. In front of the building is the medieval pillar of shame, the whipping post topped with the figure of an executioner, which has not been used since medieval times. Today it is one of the most popular meeting places for real Poznanians. You will also find in the Old Market the City Weighing Scale, formerly an official measurement office, the Bamberka's Well commemorating the settlers from southern Germany as well as their characteristic buildings. Nowadays souvenirs of Poznan are sold there, and before the buildings were in place the Fish Market used to be located in the area. Prosperous merchants once lived in the tenement buildings surrounding the market. Other than the tenements of the bourgeoisie, there are also the prestigious palaces of wealthy – such as the splendid palaces of the Działyński, which now belongs to the Polish Academy of Sciences or the Górka family Palace, which was transformed into the Archeological Musem with an exhibition on the origins of the Polish independent state as well as Ancient Egypt Exhibition boasting original Pharaoh Ramses II mummy and obelisk. One should also visit the tenement museums – Musical Instruments Musem, where among over 2500 exhibits there are primitive pipes, pianolas, a great collection of violins, also barrel organs, music boxes and also a statuette of Oscar Jan A.P. Kaczmarek. The Henryk Sienkiewicz Literary Museum boasts an impressive collection primarily dedicated to the writer's life and work and also the very popular Poznań Croissant Museum, where one may see how the Poznanian delicacy is prepared. In the middle of the market square there is another museum – The Wielkopolski Military Museum with an impressive collection of weapons, uniforms and medals, the Wielkopolska Uprising Museum presents the victorious march to independence of our region and the City Arsenal Gallery exhibits contemporary art in a system of temporary exhibitions. Fotoplastykon cooperates with the Arsenal Gallery showing photographs of Poznań over the years. Above the Market, at the summit of Przemysł's Hill, the recently restored walls of the Royal Castle rise proudly over the city. You will be able to admire the view of the city from its tower and in its rooms you will see the expanded collection of the Museum of Functional Art with the famous egg whose alleged original maker was the Faberge workshop and the swan dinner service of Augustus III the Strong. 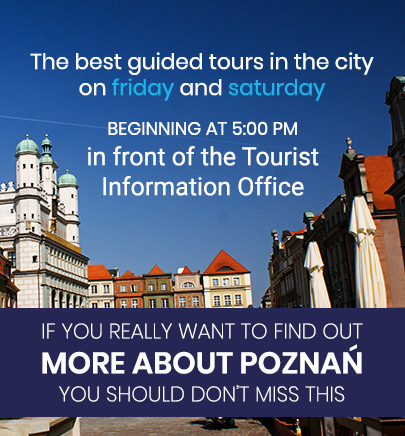 Opposite the Castle is the Monastery and Church of the Franciscans famous for its beautiful woodcarvings and miraculous image of the Virgin Mary, the Miraculous Lady of Poznań. Next in the monastic basement there is something special for model enthusiasts – there are two models presenting the fortified town of the X century and also the XVI century Poznań. Going south of the Old Market one finds probably the most beautiful Baroque church in Poland – the parish church of Poznań not only known for the breathtaking splendour of its decor, but also all the famous organs of the master craftsman Ladegast. In summer you have a chance to listen to them daily during the free concerts (from September to June only on Saturdays). The church was built in the XVII for the Jesuits, who in addition to the magnificent church also built a complex of residential, scholastic and utilitarian buildings. Today the great majority of them are used as premises of the City Council, but in the former Jesuit School, there is still a school – the School of Ballet. From mediaeval times, Jews settled around the opposite side of the Market. Their quarter, while small in size was densely populated, amounting to 25% of the city population. This quarter’s boundaries were marked by Szewska, Stawna and Wroniecka Streets, while the centre was marked by the intersection of Żydowska Street with Dominikańska Street, where the oldest synagogues, and library and the Home of the Elderly were to be found. Today little remains of the synagogue – of a number of them only the youngest survives, converted into a swimming pool by occupation authorities during World War II. The once grand offices were converted into flats and the ground floors of tenement buildings have become coffeehouses and pubs. Only the Community House serves its former purpose.